You've probably never seen a VR video where the player isn't holding a controller in each hand, acting as their hands in the game. Oculus has been using Touch in demos for ages, but the market-ready retail product is just a couple months old. By comparison to the Oculus peripheral, VIVE includes its own controllers in the base kit, though it shows in the price tag. Prior to Oculus Touch, my Oculus Rift VR experience was incredibly limited. It turns out, having hands improves quality of life just as much in a game world as the real one. 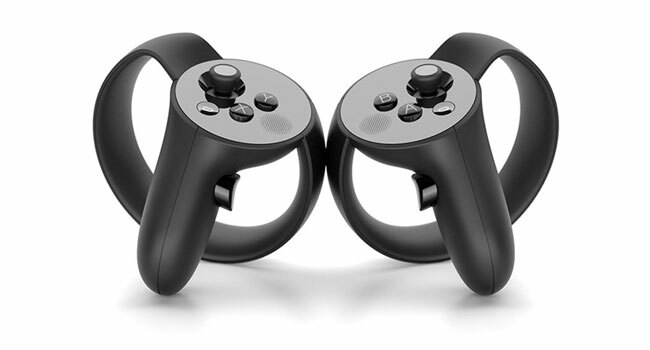 Oculus Touch isn't ambidextrous - the controllers are mirror images of each other - but that allows for a more ergonomic design and more natural grip, which is essential for some unique features. Suffice to say, Oculus with Touch is a vastly superior experience to the headset-only Rift. As above, the Oculus Touch has some idiosyncrasies, like the contact sensor that determines whether your hand is open or closed. You can point with your virtual finger by extending your real finger, which is both a fascinating idea and not-quite-perfect execution, akin to many of the Kinect motion controls I've never really been able to get to work. It will no doubt improve over time, but at present, it can be finicky. It's a minor nuisance relevant only in rare circumstances where pointing is required, and it's certainly something a game could take advantage of to great - or disastrous - effect once all the kinks have been ironed out. The Touch controllers are mirror images of each other, with a thumbstick, triggers, face buttons, and grip all serving intuitive functions. The ergonomics of the design mean they're incredibly comfortable to hold and use, but they're supremely awkward when you're trying to set them down or hand them off. Definitely worth the improved comfort and ease of use, however, as not all the buttons are easy to press on the VIVE controller without contorting your hand. Oculus Touch - to say nothing of the functionality and comfort - is essential for the authentic VR experience. The headset on its own is a delightful novelty and top-shelf party trick, but it leaves a lot to be desired in terms of immersion and finesse. The Touch lets you pick up and manipulate objects in the virtual world that are just too impractical to use with a standard gamepad. Gallery shooters aren't that much fun when you're using a controller, compared to going full Yosemite Sam, with a pistol in each hand. With virtually no basis of comparison, I'm not reviewing the Oculus Touch here, and I'm not going to even try to figure out how to give it a score, but the long and short of it is that, if you care enough about VR to invest in a headset, if you opt for the Oculus Rift, don't cheap out. Get the Touch, because if you're going to do something, do it right.